BOURNE, Mass. 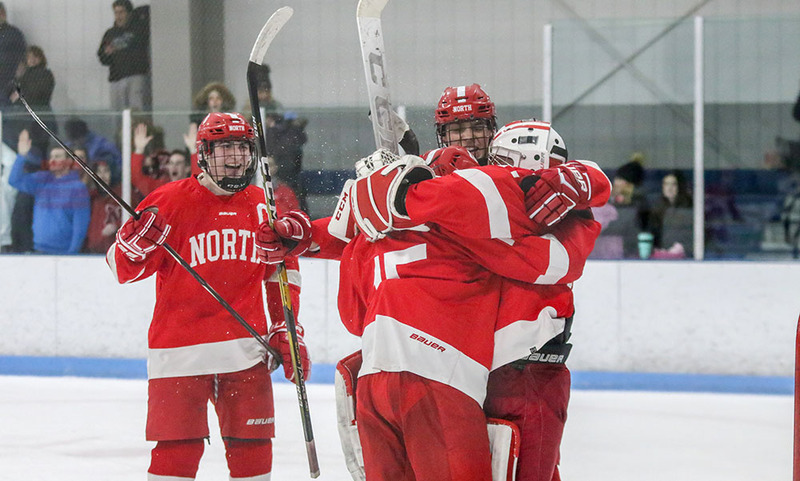 – The 2018-2019 Franklin boys hockey team has seen it all. 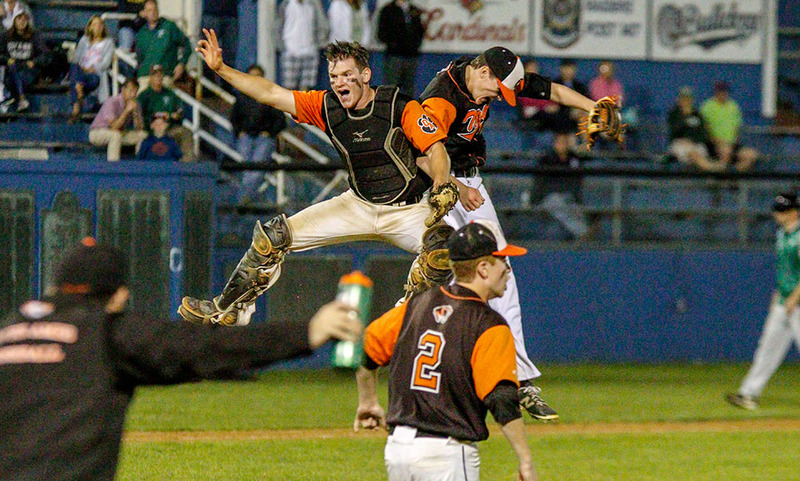 Despite their record, which earned them the lowest seed in the D1 South tournament, there aren’t many teams that are as battled tested as the Panthers. 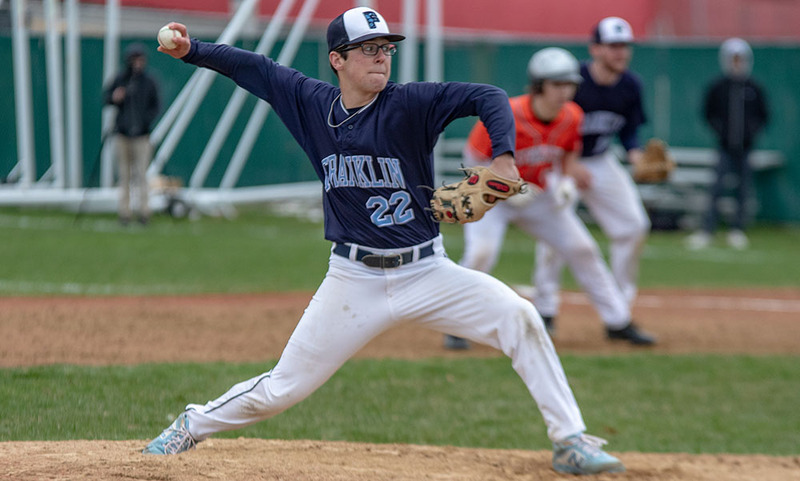 The gauntlet of a regular season, which featured wins over inaugural Super 8 selections Marshfield and St. Mary’s, paid off for Franklin in its first postseason game of the year, earning a 1-0 win over #6 Falmouth in a game that wasn’t as close as the score might indicate. The Panthers pounded the Clippers with chance after chance, registering 38 shots on goals while limiting the hosts few quality chances. But despite the dominance, missed chances left the door open for the Clippers and Franklin had to hold in the final seconds to preserve the win. Franklin came out flying in the opening period, applying a lot of pressure in the offensive zone that resulted in early scoring chances. Five minutes in, senior Brendan Sicchio found classmate CJ Spillane but his backhand chance was turned away. Just seconds later, senior Zac Falvey sent a pass across the crease to classmate Dan Magazu, but Falmouth goalie Kevin Duarte made a terrific save to rob Magazu of the opening goal. While Magazu had his chance taken away, the Panthers were able to capitalize on the faceoff that it earned. First it was senior Scott Elliott that blasted a shot that was turned aside. The rebound found its way out to junior Tom Tasker, who blasted a shot through traffic. Duarte again made the save, but the rebound popped out to senior Joey Lizotte. Lizotte had the chance to try and put a shot on goal from in close but instead made a terrific unselfish play, sliding the puck across to junior Kyle Hedvig for an easy tap in to make it 1-0. While that was Franklin’s lone goal of the game, it was far from the last chance for the Panthers. Four minutes after the goal, Elliot came flying in but his wrist shot hit off the crossbar and stayed out. Franklin earned a power play opportunity with under a minute in the first, and took 1:38 of the man-up chance into the second, but couldn’t convert. The Panthers were whistled for a slash three minutes into the second period but the defense prevented the Clippers from any dangerous chances. First it was Elliot coming up with an early clear, and then Falvey made a nice play near the blue line that forced a turnover and led to a clear. Franklin junior goalie Ray Ivers (21 saves) made two stops on the power play to preserve the lead. A crosscheck call put Franklin back on the power play with 7:40 left in the second, and the Panthers went on a 5-on-3 opportunity for 28 seconds after an interference cal, but the Panthers were unable to get a good look on goal. 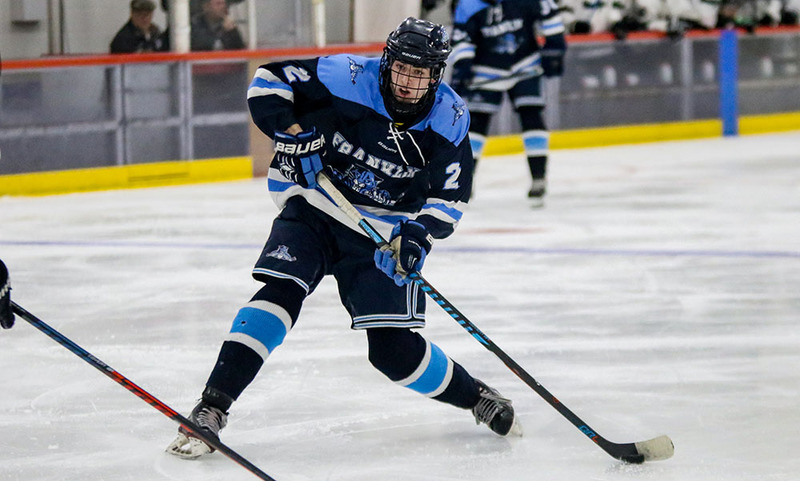 The best chance of the period came at the end of the second penalty when junior Colin Hedvig passed up on a shot to deliver a pass through traffic but Duarte was able to get his pad to the puck just before Elliot could connect. In the final couple of minutes of the second, Colin Hedvig found Shane McCaffrey but his bid hit off the post, and Kyle Hedvig’s follow up chance was somehow stopped by Duarte. In the final minute, Cam Cassella blasted a slap shot that handcuffed Duarte but the senior goalie was able to keep the puck out. Chances were sparse in the final period, with Casella getting a shot through traffic with Kyle Hedvig and McCaffrey in front trying to bat in the rebound. With just under three minutes to go, Spillane used a self pass to beat the defense but Duarte came flying out of goal and made a diving poke check to thwart the chance. Franklin came within inches of scoring an empty net goal when the Clippers pulled Duarte in favor of an extra attacker in the final two minutes, but shots from their own defensive zone ended up as icing. After matching minors, the Falmouth bench was called for a misconduct and Franklin finished the final 40 seconds on the power play. 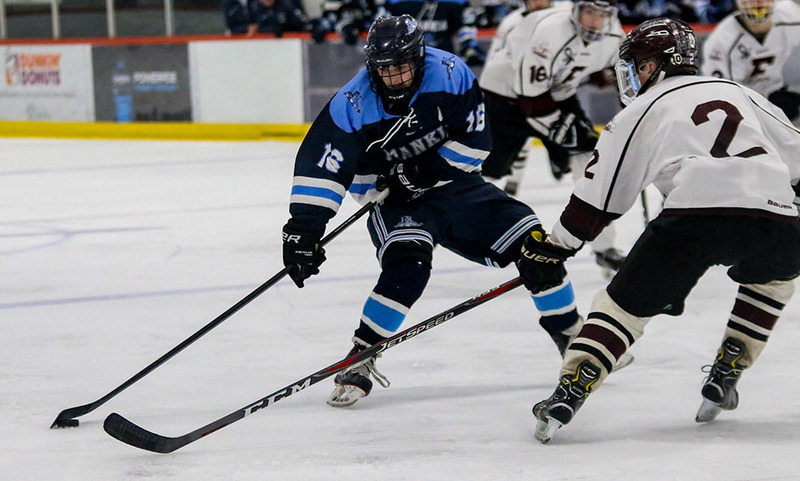 The Panthers will now renew acquaintances with league rival Mansfield, the third seed in the D1 South tournament, Franklin boys hockey will play the Hornets on Saturday at 3:30 at Gallo Arena. The teams skated to a 2-2 tie on January 21st.